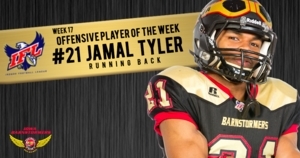 DES MOINES - Iowa Barnstormers running back Jamal Tyler was named the Indoor Football League’s Offensive Player of the Week for Week 17, the League announced today. Tyler (5'10, 185, Pittsburg State) earned IFL Offensive Player of the Week Honors after leading the Barnstormers rushing attack against the Cedar Rapids Titans in week 17. The first year rookie carried the ball 12 times for 79 yards and two touchdowns. The Barnstormers 54-21 victory over the Titans also landed them the #1 seed in the playoffs. The team will host the #4 seed, the Nebraska Danger, on Friday night in the first round of the playoffs. The Indoor Football League awarded defensive back Trey Wafford of the Sioux Falls Storm with Defensive Player of the Week, while running back Jamal Miles of the Arizona Rattlers earned Special Teams Player of the Week. Tyler and the Barnstormers will return to Wells Fargo Arena this Friday, June 22 as they host the Nebraska Danger in the playoffs. Kickoff is at 7:05pm. Tickets are available now for as low as $14, call the Barnstormers at 515-633-2255 to order yours today and cheer on the Barnstormers as they battle their way to the United Bowl Championship.